A commanding officer of the Special Forces Regiment (Airborne) of the Philippine Army was killed during an encounter with a notorious terror group in Mindanao on Thursday (January 12). Captain Clinton Longbas Capio perished during the nine-hour firefight against an estimated 60 to 80 heavily-armed Abu Sayyaf militants. According to Major Filemon Tan Jr., spokesperson of the Western Mindanao Command, Captain Capio fell when an enemy bullet hit him on the right temple. The loss of Captain Capio makes him the first casualty of 2017 on the war on terror in Mindanao. Four other soldiers were also wounded during the encounter which occurred in the village of Cabcaban in Sumisip, Basilan. One is a Special Forces member (Sergeant Gilbert Dumlao) and three are infantry soldiers (Marvin Indog, Joel Manuel, and Arthur Jimenez). The military organized the attack after receiving intel that armed Abu Sayyaf members were converging in the area. The terror group led by a certain Furuji Indama held the ground for several hours before retreating, leaving behind at least two of their dead comrades. Captain Capio hails from Amlimay, Buguias, Benguet. Before joining the Philippine Military Academy, Capio took up engineering in Saint Louis University in Baguio City. He then entered the military academy and graduated in 2006 as part of the Mandala Class (Mandirigmang Dangal ng Lahi). 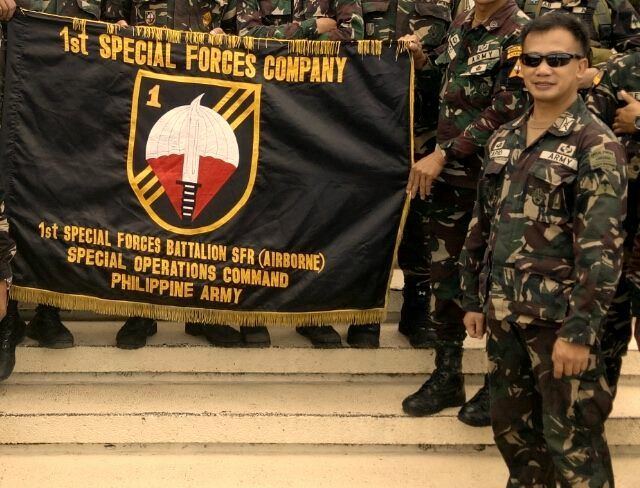 A commanding officer of the 1st Special Forces Company, he was assigned to Basilan to help fight the hundreds of Abu Sayyaf members that still operate within the island province. According to reports, Captain Capio's remains will be flown by military plane to Baguio City as soon as the appropriate military honors are done. He was 34 years old and he left behind a wife and a three-year-old daughter. Messages of support for the fallen officer were posted online by friends, relatives, and fellow soldiers. Randy Diaz, also from the Philippine Army, wrote on his wall, "Captain Clinton Capio, sir thank you for being a good captain to us. We the troops of the 1st Company are proud of you and we salute you sir for being a brave hero. Our deepest sympathy to your bereaved family." Photo Credit: Randy Diaz via Facebook.